Te Papa’s curator of terrestrial vertebrates Dr Colin Miskelly tells the second part of the unfolding story of the emperor penguin that went where none had gone before (at least in the age of digital media). Colin accompanied Department of Conservation staff to Peka Peka Beach on the morning of 21 June, and identified the bird just before the first journalists and media photographers arrived. He told the first part of the story in a Te Papa blog posted on 23 June. To recap the story so far. New Zealand’s second ever emperor penguin came ashore on the west coast north of Wellington late in the day on Monday 20 June. The bird was a juvenile, estimated from plumage coloration to be 2.5 or 3.5 years old. Under the guidance of the Department of Conservation, Peka Peka residents set up a roster of round-the-clock minders, ensuring that people kept a respectful distance, and that there was no chance of the bird being attacked by roving dogs. 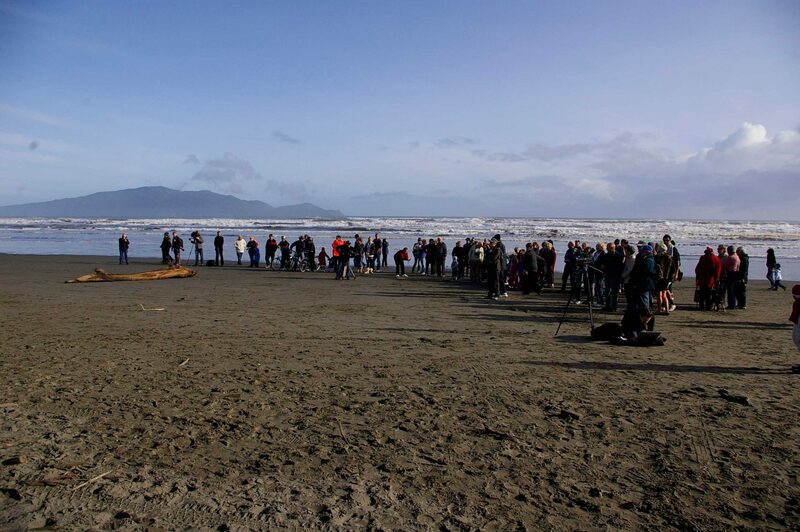 When we left the penguin, and the story, on 23 June, the bird was still on the beach in healthy condition, and was attracting the rapturous attention of the local community, bird-watchers from throughout New Zealand, and the world’s media. It had become, without doubt, the most famous penguin on the planet. Why was the penguin ashore on Peka Peka Beach, and how did it get there? Young emperor penguins spend the first 5 years of their lives at sea, away from the Antarctic shoreline. Most live among the pack-ice, but satellite-tracking studies have revealed that some birds travel much further north, into the open Southern Ocean, well away from ice. With a world population of up to 400,000 emperor penguins, it is not surprising that the occasional bird pushes the limits and ends up beyond their normal range. Birds of many species are renown for turning up in unusual localities; this feature of their biology delights bird-watchers everywhere – you never know what might turn up next! Most emperor penguins stay close to floating ice, meaning that they have the opportunity to climb (or jump) out of the sea to have a rest or escape from predators. Those birds that swim further north forego this option. Like most other penguin species, they stay in the water for weeks or months on end. We presume that the Peka Peka penguin came ashore for a rest. It was plump, in good condition, and would have been capable of surviving for days or weeks without feeding, as emperor penguins do throughout their lives (see previous blog). Its arrival was a natural event, and there was no reason to intervene while the bird remained in good health. The news on the morning of 24 June was not good. The penguin had been seen swallowing bits of driftwood as well as sand, and its condition had deteriorated from the previous evening. It is thought that the bird ate sand as it mistook it for snow or ice, and that it was attempting to drink or cool down, but no explanation has been offered for why it swallowed other objects from the tide-wrack. I returned to the beach with Department of Conservation staff later that morning. After viewing the bird and discussing its condition with wildlife veterinarians from Massey University and Wellington Zoo, we agreed that the bird should be taken into care, at least until sand and other foreign matter had been removed or passed from its gut. We improvised a refrigerated crate (a large plastic bin part-filled with two dozen bags of party ice), and loaded the penguin into the back of a utility truck for the 45 minute drive to Wellington Zoo. This was the first time that the penguin had been handled, which allowed it to be weighed (a healthy 23.1 kg – after 0.5 kg of sand was removed!) and a feather sample to be collected for DNA-sexing (no results received as of 29 June). 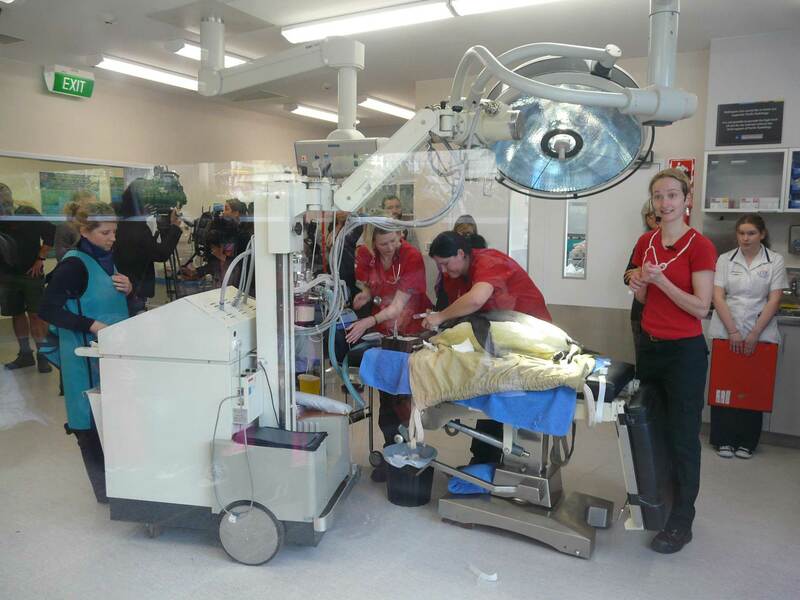 As part of the initial health check, the bird was anaesthetised and x-rayed, revealing a large mass of sand in its throat and stomach. Most of the sand in its throat was flushed out that first day, but the mass lower in its stomach was harder to budge, requiring further stomach-flushing and endoscopy over the next 3 days. 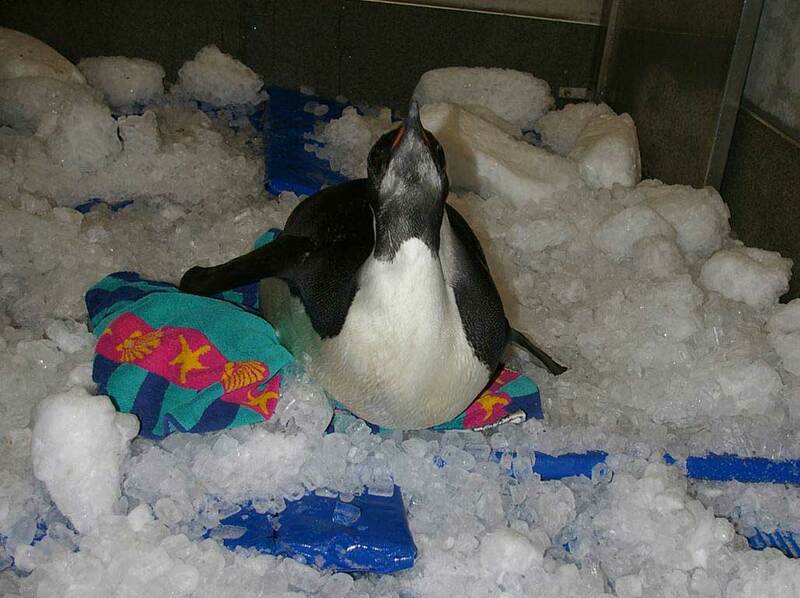 The penguin is literally being ‘kept on ice’ at the zoo, in a small air-conditioned room. It will remain there until its gut is clear of sand, and it has regained enough condition for its next adventure. I was invited back to Wellington Zoo on 29 June as part of a Department of Conservation, Wellington Zoo, Massey University and Te Papa advisory group to discuss the ongoing care and rehabilitation of the young emperor penguin. All agreed that the first priority was to get the bird back to good health, and that it should be returned to the wild as soon as practicable – preferably a long way from any sand. As the bird had swum north of its own accord, and the natural range of young emperor penguins is the Southern Ocean, we agreed that the best course of action was to return it to the sea somewhere south-east of mainland New Zealand. From there its movements will be tracked using a satellite transmitter generously sponsored by manufacturers Sirtrack, and Gareth Morgan KiwiSaver. Other options considered included trying to take the bird back to Antarctica. This was ruled out for several reasons, including: (a) that at this time of year it is impossible to get to and is too far south for a juvenile emperor penguin; (b) this bird naturally wandered to the northern edge of the emperor penguin distribution, and we would be wrong to artificially over-ride its own behaviour and inclinations; and (c) on its way north, the bird may have picked up new disease organisms or parasites from any one of up to nine species of penguins that emperor penguins don’t usually meet (namely king, gentoo, royal, rockhopper, yellow-eyed, erect-crested, Snares crested, Fiordland crested, and little penguins), and it would be foolhardy to deliberately place it back within the core distribution of several hundred thousand healthy emperor penguins. In the next blog, I’ll give an update on the emperor penguin’s rehabilitation, and details of how you can track its progress online if and when it is returned to the wild. Te Papa's Blog | The global penguin – Part 9. Heading home, or heading east? Te Papa's Blog | The global penguin – Part 10. It’s only a game. Thank you should be given to everyone who helped care for this penguin so that he could be returned to the sea to continue on his journeys. The concern and care of this animal by all those involved is heart lifting. Penguins are such beautiful creatures. Thank you for all the blog updates. Your answers to all the questions were well informed answers and taking your time to answer them is much appreciated. I wouldn’t have thought he would be so friendly. Very interesting! Thank you for the answer and also for taking the time to post about him for all of us who can’t be there. The bird was not concerned by our presence until we were within a metre of it. Three of us walked up, one held the bird’s flippers against its sides, one grabbed the head and beak, and I grabbed its legs. We then lifted it into the crate (part-filled with ice) positioned a few metres away. I was wondering wow did you get the penguin to the refrigerated crate? Did you have to tranquilize him or did you guys trick him into going there? Thank you for your very interesting posts. I incidentally had a look on the internet at the San Diego Seaworld facilities and while Seaworld has been managing to breed Emperors the facilities there did seem rather confined, particularly for a venturesome penguin as this one seems to be! I suppose my concern is that there does seem to be an element of cruelty in releasing the penguin back to the southern ocean, unless it is quite a way south. 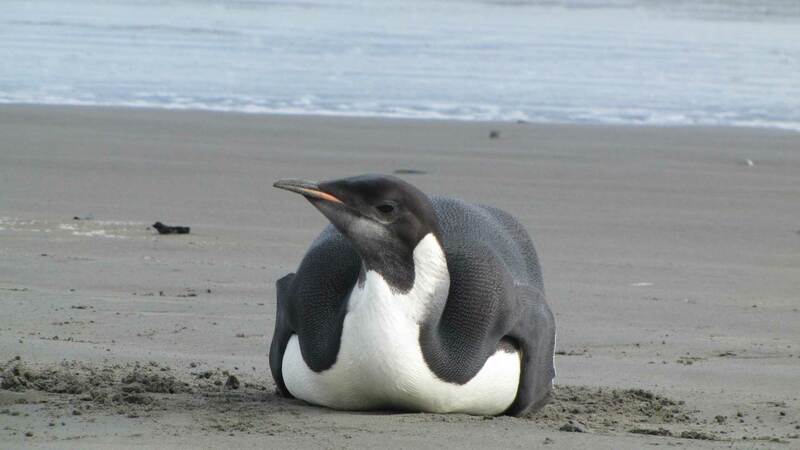 If as you state, there may be only two records of Emperors on islands about 1,100km south of NZ, and only one other historical record a long while back of an Emperor in New Zealand, it seems clear that this penguin is probably thousands of kilometres south of what would be the usual outside range. Also as Dr Argilla Vet at Wellington Zoo has noted the penguin has proven itself a sand eater, so for his own safety should be kept away from any sandy shores. It seems, if I am reading correctly between the lines, that the Advisory Group (especially Dr Cochrem) is possibly suggesting that the penguin be released in due course not that far from, although out of sight of, Stewart Island. While the risks of the penguin introducing some illness to established Emperor colonies is appreciated, it is surely clear that if released close to New Zealand this special bird will very likely perish without being able to make contact again with others of its kind – a cruel outcome to me. It is noted that Dr Orams of AUT had pointed out that the penguin has gone through unusual stress and its strength, health and potential longer term survival should be the key issues. While it is imagined that he is against release, at the least if the penguin is being released, should there not be a proper attempt made to take him a lot further south, and, perhaps release him where other juveniles were found? In the it is imagined very unlikely event that he did bring back some disease (despite Wellington Zoo’s careful monitoring over the next month or more), this should hopefully only impact those juveniles, rather than a whole colony. The intention is to release this bird well away from sandy beaches, but I do not agree with your suggestion to send the bird a long way south. This bird strayed north of its own accord. What right do we have to say that it was wrong to do so, and to force it back south? Should every vagrant bird be returned to its country of origin? Or for that matter, should Christopher Columbus have been sent back to Spain, and James Cook to England, because exploration was unnatural? For all we know, this bird has a genetic or physiological inclination to swim north, hence the suggestion to return it to the northern edge of emperor penguin range (giving it a head start of c.1000 km) and let it determine whether to continue south, or to continue on its original northward trek.